Not sure if this is known, the couple of related threads I found were strictly about PMs, but this happens everywhere. I don't think stack traces should be showing on a production server (though that may be a thing with phpBB, I wouldn't be surprised). It's not restricted to just emoji, though: any non-BMP (basic multilingual plane) character seems to cause the issue (e.g. some CJK or Indic characters, some arrow symbols etc.). The cause is most likely that the underlying MySQL DB uses the `utf8` charset instead of `utf8mb4`. This is a typical issue with that kind of setup. Data should probably be migrated to the latter charset at some point. The migration is generally not very difficult, but I'm not familiar with the specifics here at DT, so I can't say for sure. It should be done nonetheless, though (it's 2018 and emoji are really popular). Last edited by constexpr on 10 Jul 2018, 17:54, edited 1 time in total. Yeah, that's the thread I mentioned in the first sentence. Apart from it only talking about PMs, no progress had been made there, so reviving it didn't really seem like a good idea. 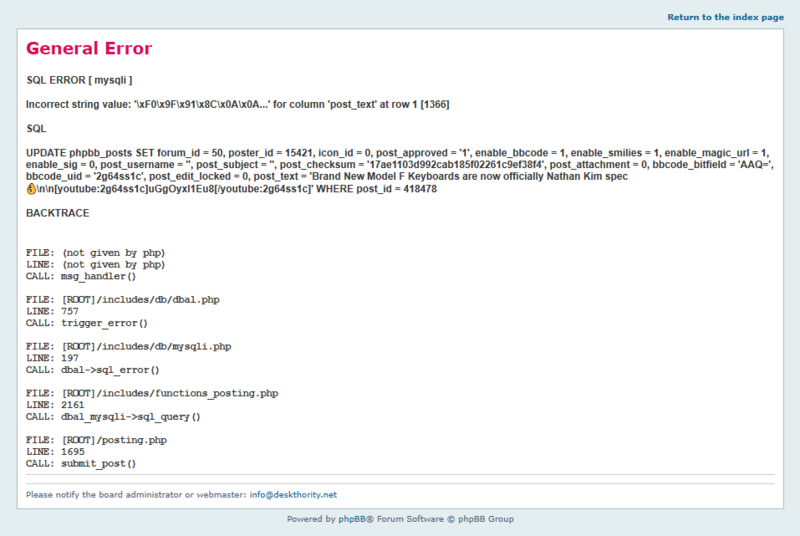 It's an issue with phpBB itself, not the unicode implementation. I'm pretty sure that's not the case, as what failed was an SQL DML statement executed by mysqli (PHP's MySQL API), not a PHP function in and of itself (which would indicate that phpBB was at fault). The error message states that the SQL engine has encountered an invalid string value — exactly what you would expect to see as a result of an encoding issue. As I mentioned, this is a well known issue with software running MySQL in the back (especially software older than a couple of years), and this is exactly the way you'd expect it to manifest itself on a forum. phpBB may rely on the DB charset being utf8, but I doubt that's the case as the two are separated by an API boundary (mysqli). But regardless of the charset issue, I feel that PHP stack traces, i.e. debug mode should be disabled on the Deskthority production environment in any case.